Synchronizing the calendar and contacts information between your iPhone and a Google Gmail account is free and easy to setup. As an added bonus, the synchronisation happens virtually in real time and “over the air” using the iPhone’s WiFi or cellular data connection to the Internet. This means if you change something on the iPhone the update will appear in your Gmail account almost instantly, and vice versa. Configuring the iPhone to work with Google couldn’t be simpler. Before you start make sure you have your Gmail email address and password close at hand. It’s also a good idea to backup any data you have in your iPhone. 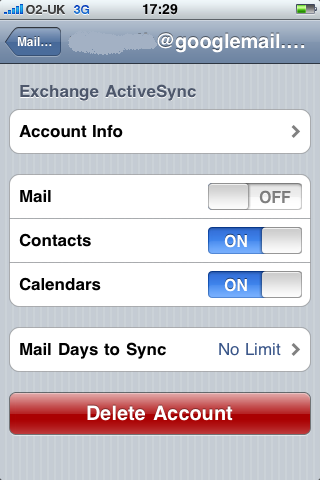 Start the iPhone “Settings” app and scroll down and tap the “Mail, Contacts, Calendars” option. Tap the option to “Add account…” and then touch Microsoft Exchange. Enter you Gmail email address in the “Email” section, and also in the “Username” section; and add your Gmail password to the “Password” entry. 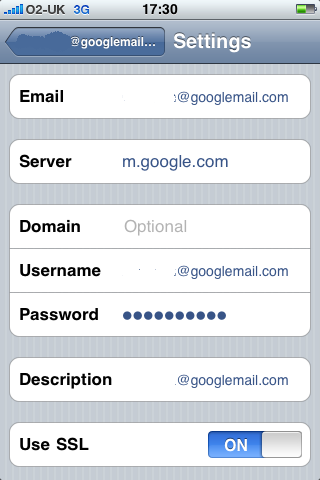 Put “m.google.com” in the “Server” entry, and move the “Use SSL” slider to the “On” position. You can leave the “Domain” entry blank. Now make sure the “Contacts” and “Calendars” sliders are both set to “On”. [Update] Google now supports Push email, so you can also set the “Mail” slider to “On”. However, in our tests we have found using Google’s Push email to the iPhone, it can take around 15 minutes or more for email that is in your Google in-box to appear on the iPhone. Finally, close the Settings tool: You’re all done, and from now on any time you add or change contacts or calendar entries in your iPhone the updates will travel across the Internet and update your Gmail account. Of course, if you change things in your Gmail contacts or calendar, the changes will also be reflected in your iPhone in just a few seconds time. This article was published on Thursday, August 27th, 2009 at 5:58 pm. You can follow any responses to this article through the RSS 2.0 feed.